The first seven richest ministers of the government of the Republic of Macedonia declared that they own assets worth 35 million euros. The convincingly wealthiest 30 million-euro official is Kocho Angjushev, deputy prime minister in charge of economic affairs and coordination with economic sectors in the Government. In addition to the apartment in Skopje, Angjushev has an apartment in Belgrade and a house in Greece. Golden jewellery, his watches and paintings and sculptures are worth 240,000 euros. Angjushev’s fleet is exceptional and consists of Maserati GT, Porsche Cayenne and Mini Countryman as well as the Regal Motor Boat. Angjushev earns income from renting two business premises and two apartments, and has five denar deposit accounts. He realized income from the sale of a 10 percent share in the ownership of “FeroInvest”. The 33-year-old Minister of Economy, Kreshnik Bekteshi, is the second youngest minister in the government’s headquarters, but at the same time second on the wealth he has declared to own. Appointed at the proposal of the Democratic Union for Integration (DUI), Bekteshi is the head of this sector since last year. Born in Kichevo, and with a degree from the University of Sheffield in Great Britain, he declared to the State Commission for the Prevention of Corruption (SCPC) that he owns assets worth as much as 2 million euros. In addition to owning land and house in Kichevo, he also has three cars. His parents, besides the house in Prishtina (Kosovo), have two apartments in Kavaja (Albania), one apartment in Basel (Switzerland), as well as three terrains and office space in Kichevo. WHAT HAS NOT BEEN DECLARED? 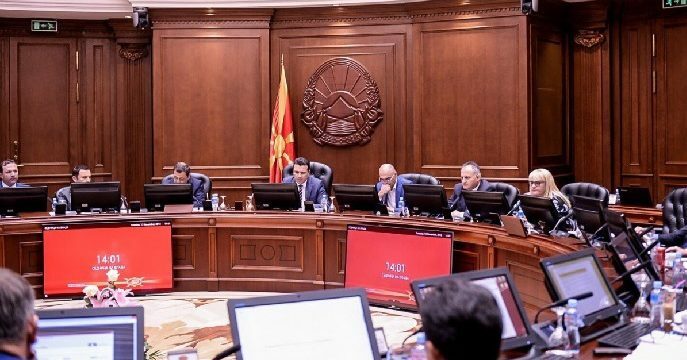 Aksel Ahmedovski, Minister without portfolio in charge of implementation of the Strategy for improving the situation of Roma in the Republic of Macedonia, has not declared his property at all. The Ministers Tevdovski, Dimitrov, Deskoska, Filipche, Manchevski, Shekerinska and Sugarevski have not declared their parents’ property. Apart from this, the Minister of Justice, Deskoska has not declared the value of the property for 19 out of 23 items related to: royalties, works contracts, foreign currency account, savings accounts and payment cards, as well the origin for part of this property. Hazbi Lika, the Deputy Prime Minister in charge of implementing the Framework Agreement and the political system is third on the list. The value of his declared property amounts to 1.123.800 euros. Lika, as a personal property, declared the monthly salary, the value of which has not been stated, and a loan amounting to 54,000 euros to be paid by 2028. The remaining property belongs to his brother, his parents and his wife. Fourth of the list of the richest members of the Government is Nikola Dimitrov from the Ministry of Foreign Affairs. He declared that he owns a property worth 830 thousand euros. He has an apartment in Skopje and owns a Mercedes B180 car. However, he and his wife own also an apartment in The Hague (The Netherlands), have two foreign currency savings accounts, and a loan of 280,543 euros. Prime Minister Zoran Zaev is fifth on the list of declared property worth 700 thousand euros. But only the claim of nearly 70 thousand euros is registered in his name. The fixed-term foreign currency deposit of 7 thousand euros is in the name of his wife, while 27 thousand euros are declared being on the accounts of his children. The house, the business space, the apartment in Strumica, the agricultural land in Murtino and the shares worth 200 thousand euros belong to his parents. The sixth place according to the wealth belongs to the Minister of Culture, Asaf Ademi, who declared property worth 520 thousand euros, but has nothing in his name. What his parents own is a house with business premises and a yard in Gostivar, a car “Renault 9”, a lease from office space of about 300 euros per month and a loan of nearly 20 thousand euros. His wife drives a car “BMW 530D”. The SCOOP survey within the project “Politically Exposed Persons” shows that officials in Macedonia have diverse assets. Houses, apartments, cars, pastures, construction lands, as well as loans and deposits are part of the things that are included in the lists declared at the State Commission for Prevention of Corruption. Mercedes, BMWs, Audi and some Golf are driven by the current ministers. The Minister of Defence, Radmila Shekerinska, is the only one of the current ministers who does not have a car. Unlike her, the families of Kreshnik Bekteshi, Suhejl Fazliu, Arber Ademi and Mila Tsarovska have three vehicles each. Oliver Spasovski, Sadula Duraku, Venko Filipche, Ljupcho Nikolovski, Asaf Ademi and Renata Deskoska have two vehicles each, and Nikola Dimitrov, Damjan Manchevski, Goran Sugareski and Dragan Tevdovski own one vehicle each. Ljupcho Nikolovski’s brother – “Fiat Stilo” worth about 3000 euros. Suhejl Fazliu’s sister – “Audi A2” the value of which is not indicated. Arber Ademi’s brother – three vehicles: a “Citroen Jumper” truck worth 4062 euros, a “Volkswagen Crafter” worth 6499 euros and “Volkswagen Passat” worth 6499 euros. All three worth around 17,000 euros. Mila Tsarovska’s brother – “Honda Accord” – worth 5800 euros. There are also art lovers among the ministers. Radmila Shekerinska owns the painting “Gypsy Woman” by Nikola Martinoski. Since its value was not specified, the SCOOP team asked for an answer from the Minister about the worth of that painting. “The painting ‘Gypsy Woman’ by Nikola Martinoski has been owned by the family for more than 40 years, and the minister has received it as a legacy from her deceased grandparents, the family has no data about its value”, was written in the response from Shekerinska’s cabinet. The Minister of Interior (MOI) Oliver Spasovski declared that he owns paintings worth about 4,000 euros, but without giving information on how they were acquired. Arber Ademi‘s wife has a golden jewellery worth nearly 5,000 euros, while Renata Deskoska has precious metals worth about 9,000 euros. Tevdovski, Dimitrov, Deskoska, Filipche, Manchevski, Shekerinska and Sugarevski have not declared their parents’ property. Out of the ministers who have declared their parents’ property, the most valuable property is owned by the parents of Kreshnik Bekteshi, over 660 thousand euros, which are also the only parents with property abroad, that is, two apartments in Kavaja (Albania) and a house in Prishtina (Kosovo). The parents of the other ministers most often own apartments, houses, agricultural lands, pastures and buildings throughout Macedonia. The property of the ministers without portfolio ranges from 300 to 400 thousand euros individually. Approximately 408 thousand euros is the worth of the property of the Minister without portfolio in charge of foreign investments, Adnan Qahil. He declared that he and his wife had each one apartment in Skopje, “Mercedes E Class” and “Ford Mondeo” cars. Qahil’s wife has jewellery worth about 1000 euros and two domestic payment cards in the total amount of 10 thousand euros. His parents have a house with a yard and a business premises in Skopje. The second richest minister without portfolio, with a property list of about 406 thousand euros, belongs to Zorica Apostolska, a minister without portfolio in charge of foreign investments. The Minister Apostolska drives “Ford Focus” and has two foreign currency savings accounts, with a total of 4200 euros. Her husband owns three houses in Skopje, Rostushe and Resen. He also has an apartment in Skopje, and he also collects rent from an apartment in the amount of 200 euros. Apostolski drives “Volkswagen Polo Classic” and has two denar accounts of about 10 thousand euros. Their children have a deposit of 3,200 euros. Bardhyl Dauti, a minister without portfolio in charge of attracting foreign investments, has a property worth 372,516 euros. Dauti has a loan of 14 thousand euros and drives “Mercedes” A class. His wife has a salary of 340 euros. Dauti’s parents have a house, office space, agricultural land and fences in Tetovo, as well as a salary of about 500 euros. The property list of Minister Robert Popovski, Minister without Portfolio in charge of communications, accountability and transparency, amounts to 365,203 euros. He and his wife each own one apartment in Skopje. Popovska also owns paintings worth about 20 thousand euros. Together, they have a house and a yard in Skopje, and Popovski’s parents have an apartment in Skopje. Zoran Shapurikj, Minister without portfolio in charge of regulation for improving the investment climate for domestic enterprises, has a property list of EUR 369,843. He has three apartments out of which two are in his private ownership and one in joint ownership with his wife. Shapurikj drives “Hyundai 1.6”, and his wife “Seat Ibiza”. The Minister has several shares, as well as a royalty fee of 800 euros and a claim on the basis of work performed in the amount of 1,400 euros. The minister has a salary of 1000 euros, while his wife’s salary is about 550 euros. She also has a foreign currency savings account with 2,000 euros and a debt – a credit card of 1000 euros. While Shapurikj, as a personal property, has several foreign currency deposits in euros, francs and dollars. The Deputy Prime Minister, in charge of European affairs, Bujar Osmani, declared that he owns a property worth 270,000 euros. His wife receives a monthly salary of 400 euros and owns a car “Opel Corsa”, while his parents receive a monthly pension of about 270 euros and own a house with a yard in Skopje, worth about 170 thousand euros. The minister without portfolio with the lowest value of the property list is Minister Edmond Ademi, in charge of the Diaspora with a property list worth 78 thousand euros. He declared having a debt – a lease of nearly 10 thousand euros and a “Toyota Corolla” motor vehicle. Ademi’s wife has a denar savings account of about 26 thousand euros and is the founder of the company for consulting “IMPAKTA” DOOEL. As common property, there is a pre-contract for purchase of real estate worth 28 thousand euros. What does the Law on Prevention of Corruption provide? According to Article 33 of the Law on Prevention of Corruption adopted in 2002, the elected and appointed officials should declare their property and the property of their family within 30 days of taking office. Officials are obliged to report any change in the property, and also to submit documents about their property. Article 36 states that it is possible to investigate the property of the official if they have not provided data about their property. The same applies if they have given false data, if they have not reported a change of property, or if their property has disproportionately increased during the performance of their duty. No sanctions for not declaring property or any irregularities with regard to the property status of the officials have been published on the web site of the State Commission for Prevention of Corruption. The only thing that can be seen is a series of public warnings for a determined conflict of interest, but they also refer more to officials from lower echelons. Do we want democracy or dictatorship?